For FamiliesClick here to find out more about how you and your family can become involved. Our StoriesEvery family has a story. What’s yours? 2019 County Community Partners Survey2019 County Community Partners Survey links and instructions. The Region A Partnership for Children seeks qualified applicants for full time positions to carry out the Parents as Teachers program home visiting program in partnership with families with children ages prenatal to five in Jackson and Haywood Counties. Parents as Teachers provides family support and developmental information through home visits, group support meetings and referral to other providers. A Bachelor’s Degree in Social Work, Early Education or a related field and at least two years of related experience working with families and young children is required. Position open until filled. Health, retirement and generous vacation package provided. Salary commensurate with qualifications. Only professional resumes accompanied by cover letters will be considered. Qualified applicants may submit a Cover Letter and Resume to: Janice M. Edgerton, Executive Director, jedgerton@rapc.org. Region A Partnership for Children, 116 Jackson St. Sylva, NC 28779. Become a Champion for Children! The Region A Partnership for Children can provide you with many opportunities to get involved with your community. Your expertise and time are greatly appreciated. If you have a few hours to spare and would like to seek volunteer opportunities within the community, please contact us. If you are a student and are interested in possible service learning opportunities, please let us know. We may be able to partner with your school or class on local projects. Your Financial Support is Greatly Appreciated! You can help make a difference in your community by donating your time and experience to help grow and make our programs successful. The Region A Partnership for Children is accepting proposals from qualified contractors to provide Smart Start funded activities for the fiscal years 2019-2020 and 2020-2021. Proposals for evidenced-based activities that will support the early development of children and the goals of Smart Start in the seven westernmost counties of North Carolina will be considered by the Region A Partnership for Children Board of Directors. The proposals for activities that may be funded through Smart Start for Health, Early Care and Education and Family Support programs serving children and families birth through kindergarten must be received by the Region A Partnership for Children by January 18, 2019 by 5pm including all required documentation. Parents As Teachers Recruitment Time! Parents as Teachers is free for families through Smart Start and the Region A Partnership for Children. 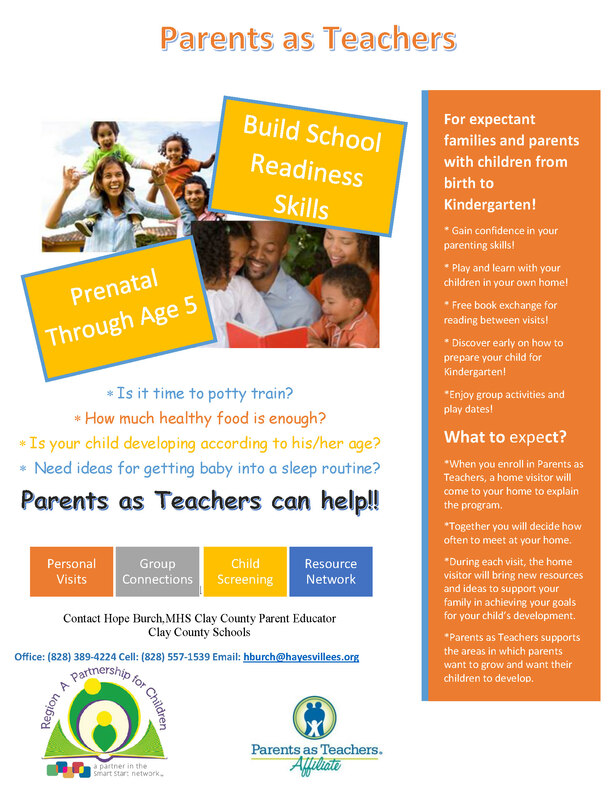 Please share this information with families who have children prenatal to five years of age. We are able to add more family to our programs in Clay County, Cherokee County, Jackson County, and soon, Haywood County. If interested, please contact us at 828.586.0661 or officemanager@regionakids.org. Jessica Gonzalez, Jackson County Parents as Teachers Educator is available now to visit families in Jackson County in their homes to offer information and resources that will help prepare young children to have the best start in life. Ms. Gonzalez is a trained Parent Educator in the nationally recognized, evidenced based Parents as Teachers home visiting program that focuses on healthy child development, school readiness and family well-being to create great opportunities for children to reach their full potential. 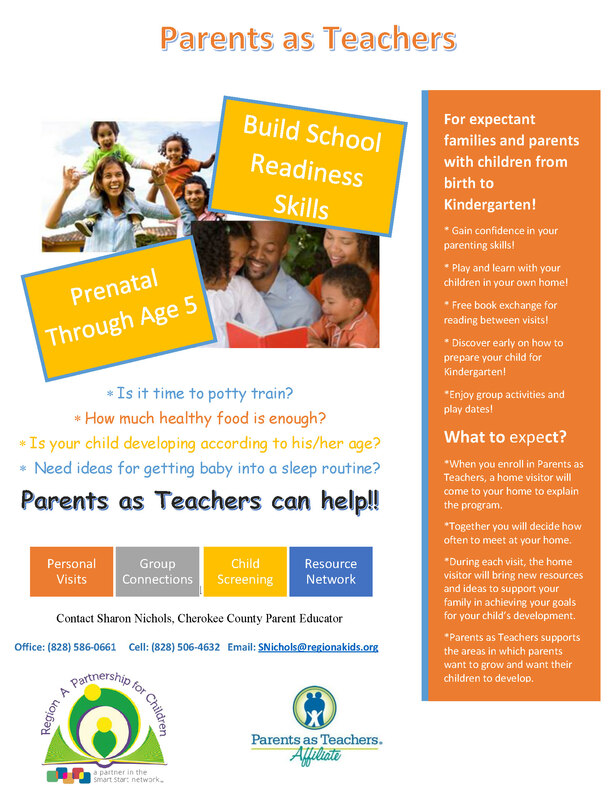 Sharon Nichols, Cherokee County Parents as Teachers Educator is available now to visit families in Cherokee County in their homes to offer information and resources that will help prepare young children to have the best start in life. 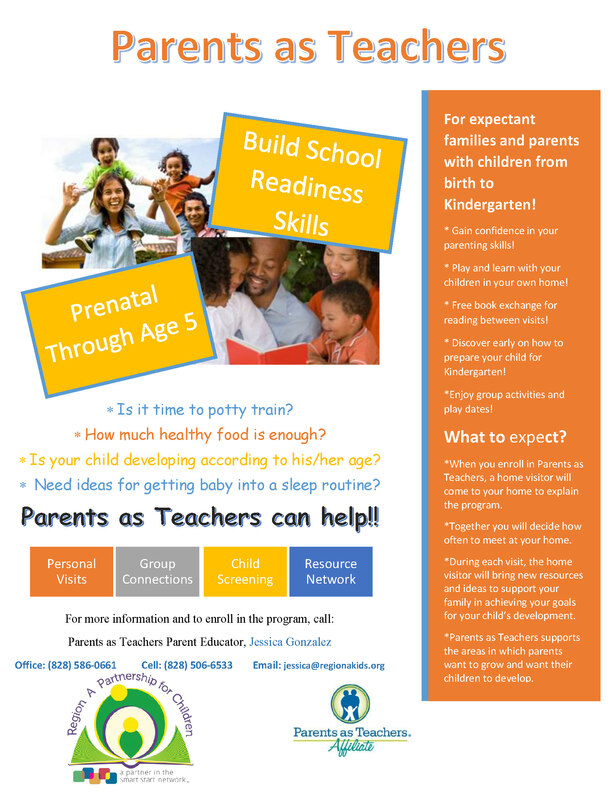 Ms. Nichols is a trained Parent Educator in the nationally recognized, evidenced based Parents as Teachers home visiting program that focuses on healthy child development, school readiness and family well-being to create great opportunities for children to reach their full potential. Hope Burch, Clay County Parents as Teachers Educator is available now to visit families in Clay County in their homes to offer information and resources that will help prepare young children to have the best start in life. Ms. Burch is a trained Parent Educator in the nationally recognized, evidenced based Parents as Teachers home visiting program that focuses on healthy child development, school readiness and family well-being to create great opportunities for children to reach their full potential. Jamilah Dixon, Haywood County Parents as Teachers Educator is available now to visit families in Haywood County in their homes to offer information and resources that will help prepare young children to have the best start in life. Ms. Dixon is a trained Parent Educator in the nationally recognized, evidenced based Parents as Teachers home visiting program that focuses on healthy child development, school readiness and family well-being to create great opportunities for children to reach their full potential. The Parents as Teachers (PAT) National model, funded locally by Smart Start and the Region A Partnership for Children, is designed to help parents raise healthy, successful children by giving them hands-on support and effective learning tools during the critical first years of life. PAT focuses on early childhood development and education for children ages prenatal through age five. The program operates with the understanding that parents are most influential as each child’s teacher and by providing for their health care needs during the most critical period of development. PAT home visits occur at least monthly depending on the agreement reached between the family and the PAT Educator. Families will also be invited to participate each month in group meetings to develop great connections with other families and to share interests and resources about child development and family activities. The Region A Partnership for Children is the non-profit organization that manages Smart Start and NC Pre-K programs along with other early education, health and family support initiatives for young children and their families in the seven westernmost NC counties and the Qualla Boundary. The Region A Partnership for Children in accepting proposals from qualified contractors to provide Smart Start activities. Two contracts are currently open until filled. Child Care Health Consultant in Macon County and Parents As Teachers Home Visiting Program in Swain County for the 2018-2019 (current) fiscal year. Proposals must be received by the Region A Partnership for Children by October 26, 2018 at 5pm including required documentation. 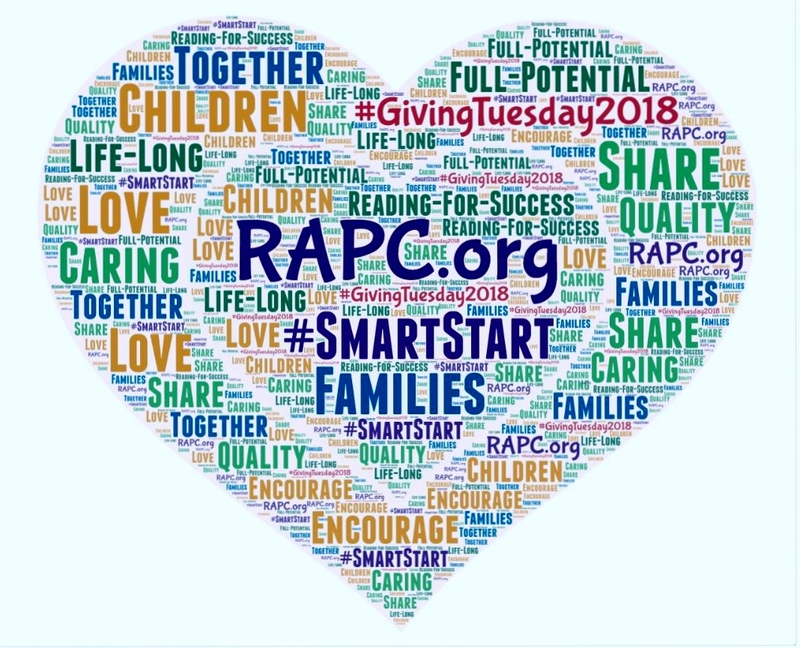 The mission of the RAPC is to improve the quality of life for young children and families in western North Carolina by encouraging advocacy and collaboration and funding services that focus on prevention and early intervention.